Oxalis is a group of weeds found in most home gardens and waste areas. Three different species are described here. Growth Habit: Oxalis corniculata is the smallest of the three Oxalis species described here. Unlike the other two species, it does not produce bulbs. 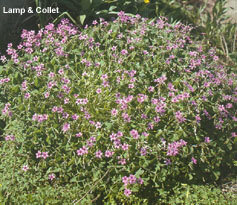 It is commonly found in home lawns, where it assumes a creeping habit. Type of Plant: Oxalis corniculata is an annual. Flowers: The yellow flowers which are approximately 6mm in diameter have five petals and number 1-6 per stem. This plant flowers most of the year. Fruit/Seed: Seeds are about 1-1.3mm long and 1mm wide. Dispersal: Seeds are readily spread by soil and water movement, and may also be scattered by machinery such as lawn mowers. Distribution: Found in all Australian states in grassy and waste areas. Status: Declared a Secondary weed in Tasmania. May invade lawns and displace desirable grasses. May cause oxalate poisoning in livestock if eaten. Growth Habit: A low growing, bushy plant which produces many underground bulbs. It is far more invasive than O. corniculata and is commonly found in gardens and potted plants. Type of Plant: A perennial, bulbous herb. Flowers: Sometimes known as the pink shamrock, the flower is pink or purplish in colour with a diameter of 10-12 mm. This five petalled flower grows in groups of 12. Dispersal: Main reproduction is by the bulbs, which are easily dispersed by any soil movement. Physical removal of the plant usually leaves several of the small bulbs behind, making the plant very difficult to eradicate. Distribution: Found in most states, it prefers growing in cultivated soil. A major garden weed in most areas. Extremely difficult to control once well established. Growth Habit: Oxalis pes-caprae is a very invasive plant that produces a main tuber-like root, plus several small bulbs. It has trifoliate heart-shaped leaves with brown or purple spots on top. It occurs widely throughout the cooler regions of Australia. Type of Plant: Winter or spring growing biennial plant. 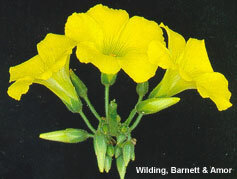 Flowers: A yellow trumpet shaped flower which grows in groups of 3-16. Dispersal: Soursob primarily reproduces from the bulbs, which may be spread by any soil movement. Distribution: Grows in cultivated areas and loves gardens. Grubbing (all year). Remove entire plant including bulbs. Due to the numerous small bulbs, this can be a very tedious task. Mulching (all year). Heavy mulching will suppress oxalis. Herbicide (summer, spring and autumn). Herbicides registered in Tasmania include glyphosate, metsulfuron and dicamba.